I finished doing laundry and had like a gagillion clean towels to put away, but when I went to put them in the linen closet, I realized there was no room. I decided to fix it up a bit and shuffle some things around to make some space. Plus, I’ll need to make a list of things to buy to organize this bad boy. 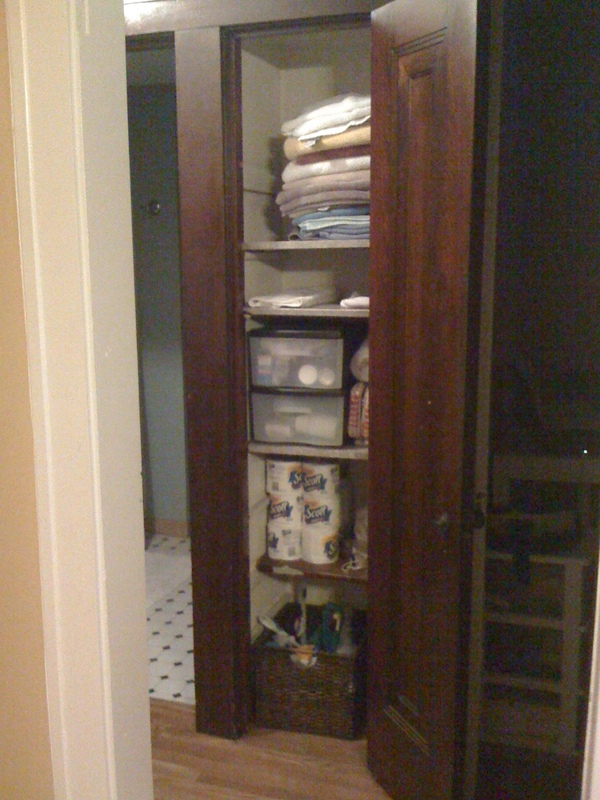 Our lovely linen closet measures 1’7” wide, 1’1” deep, and 7′ tall and has four movable wooden shelves, which are covered in wallpaper (yes, wallpaper). 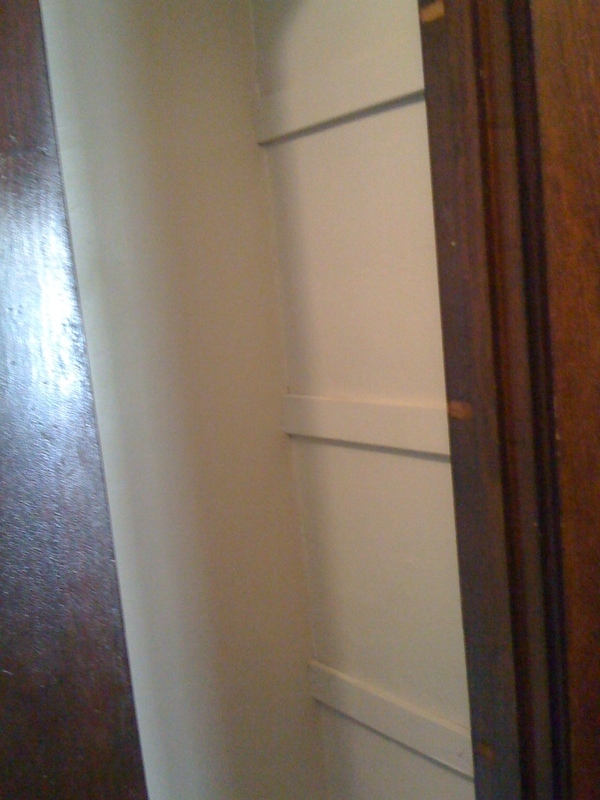 Also, the shelves are too small for the deep closet so there are open gaps in the back of a few of the shelves. I like this photo that I found at Imperfect Homemaking because it seems to be a similar size to ours. I like the thick shelves that seem to seamlessly fit into the space and the storage is simple and practical. The additional decorative flare is a cute touch, too. 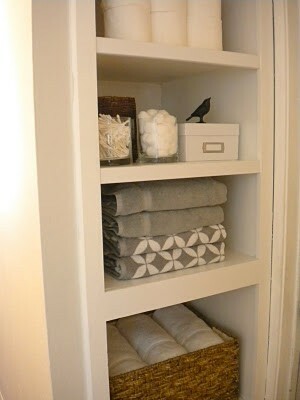 This linen closet (found on Classic Chic Home) is all about functionality. True, the colors aren’t matchy-matchy like others but, who cares? It doesn’t have to be picture perfect. 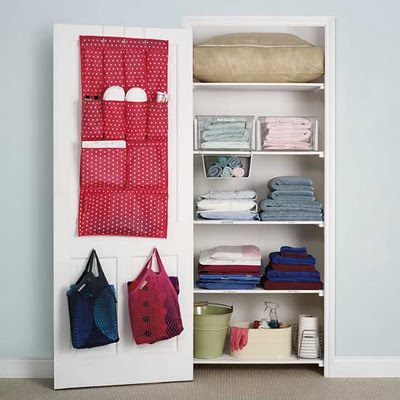 This closet solves the clutter problem…and that’s the point, afterall. Extra bath supplies like toothpaste, deodorant, etc. Items that are personal in nature (the goodies you don’t want seen). If you have a larger closet, you can store extra bed linens and blankets. For more on what to put in your linen closet, visit Real Simple or check out my “Organize” board on Pinterest for more photos for inspiration. So, I pulled a few ideas from the photos above and began working on our linen closet. I started by removing the 4 shelves. Once they were out, I could see that someone had added quarter round as the braces for the shelves, instead of using the larger pieces of wood that were already in place. These weren’t sturdy at all, and I wanted to change the shelving space, so I pulled them out (easy to do, considering they were hardly nailed in). Since our walls are plaster on lath, the wall easily cracks and the plaster will crumble where there are holes. 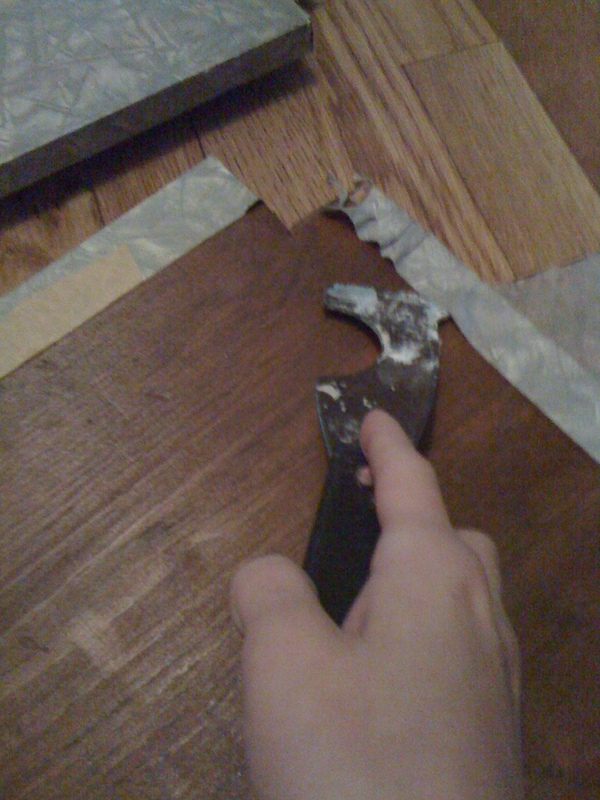 I used a steel scraper (putty knife is best) to fill each hole with patching compound, allowed it to dry (about 45 min. 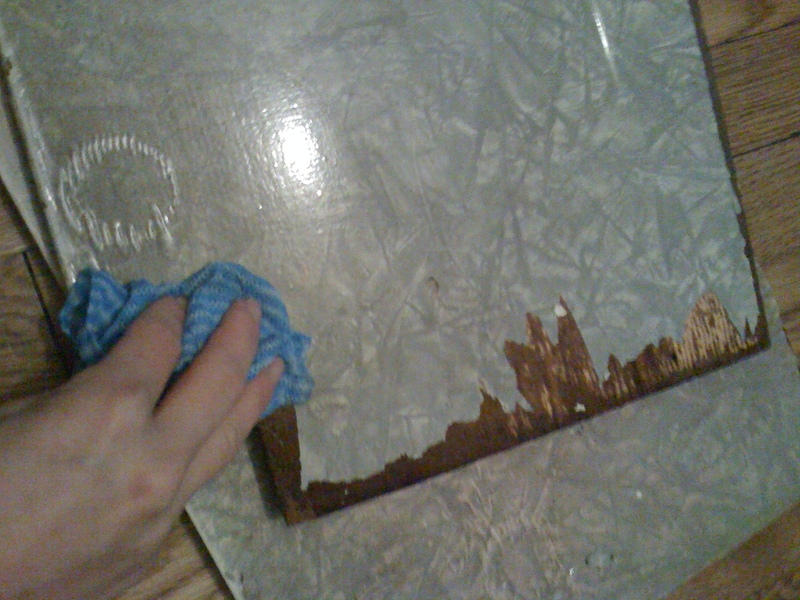 ), and then sanded the patch smooth. For instructions on how to patch plaster, visit BHG for “how-to” instructions. 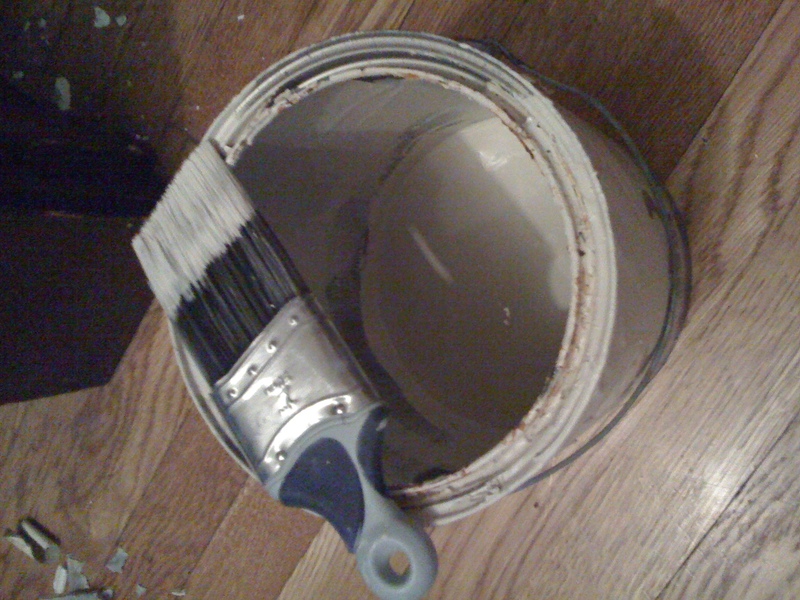 I decided to paint the closet walls “Realist Beige” from Sherwin Williams because I had just enough left over from when I did the hallway. Using an angle brush with a small handle, I put on the first coat. My stepfather was a painter, so he tought me how to paint along trim without taping but, its probably a good idea anyways. 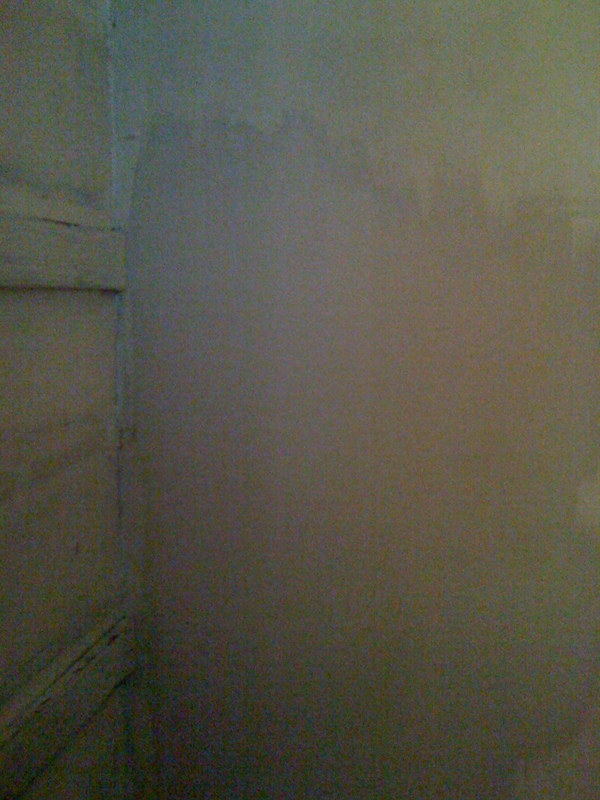 Here is what the color looked like on the back wall of the closet. 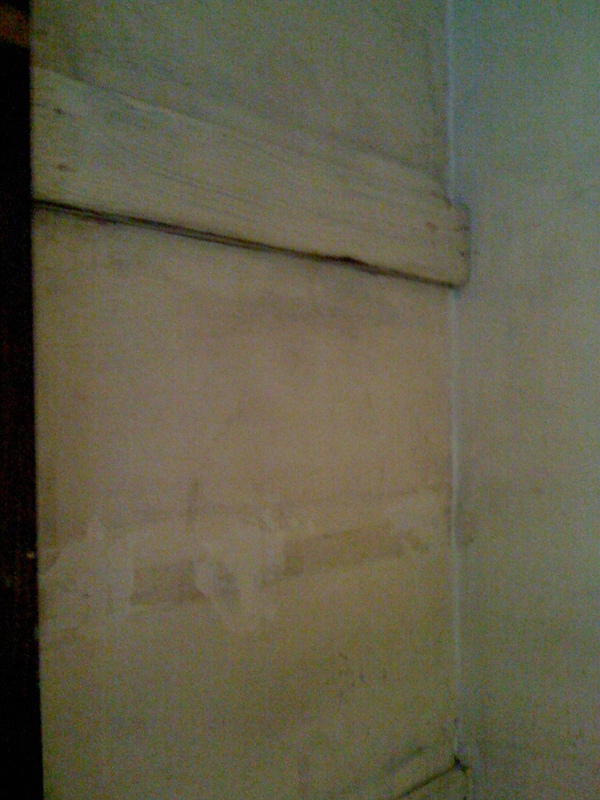 You can see in this photo how the walls were originally painted a yellowy-beige color and it didn’t cover the wall very well- you could see through. While the first coat of paint dried, I began tackling the shelves. 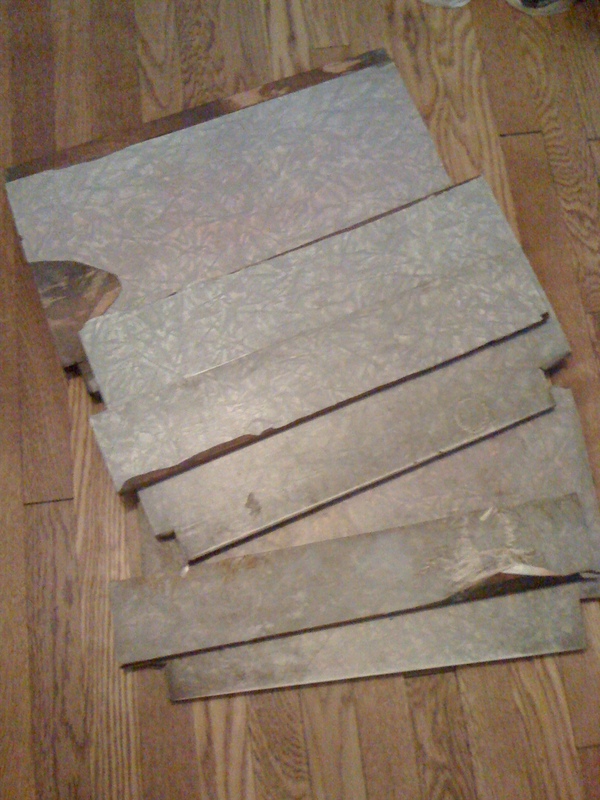 There were 4 larger pieces of wood and two small pieces, which were all wrapped in an ugly gray wallpaper. 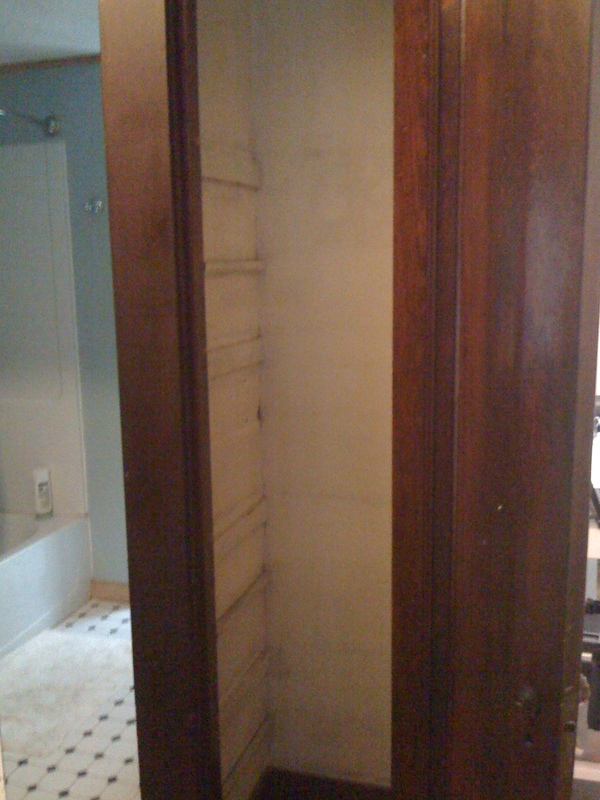 Wouldn’t you know it, they stuck the wallpaper directly on the wood…no backing! I used warm water and fabric softner to help soften the edges and pealed each piece of wood…this was the longest part of this project (took several hours) because I was taking my time to make sure not to damage the wood. The end result looked something like this. Somewhat damaged, but in good shape overall. I sanded them down a bit to make sure that it was smooth and then painted them with a white semi-gloss paint. 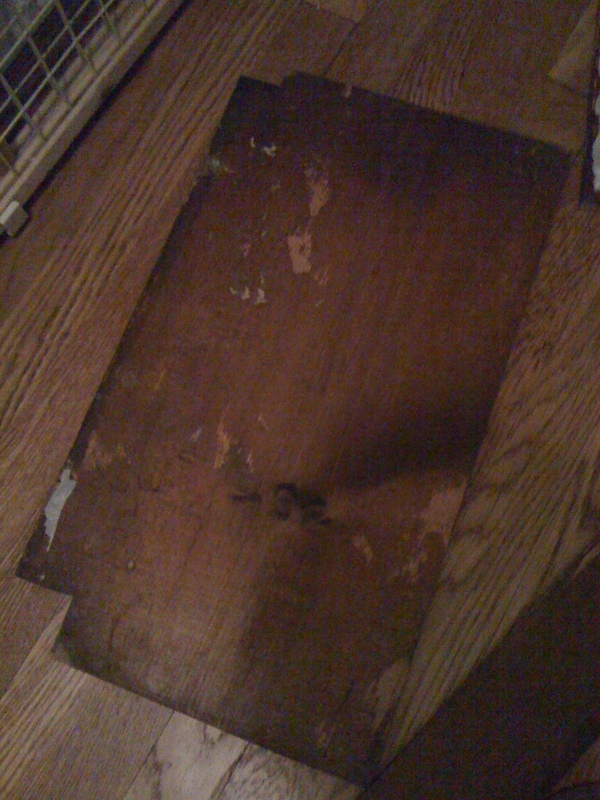 Note the small notches in the two corners…these are intended to help the shelves fit into the door frame. 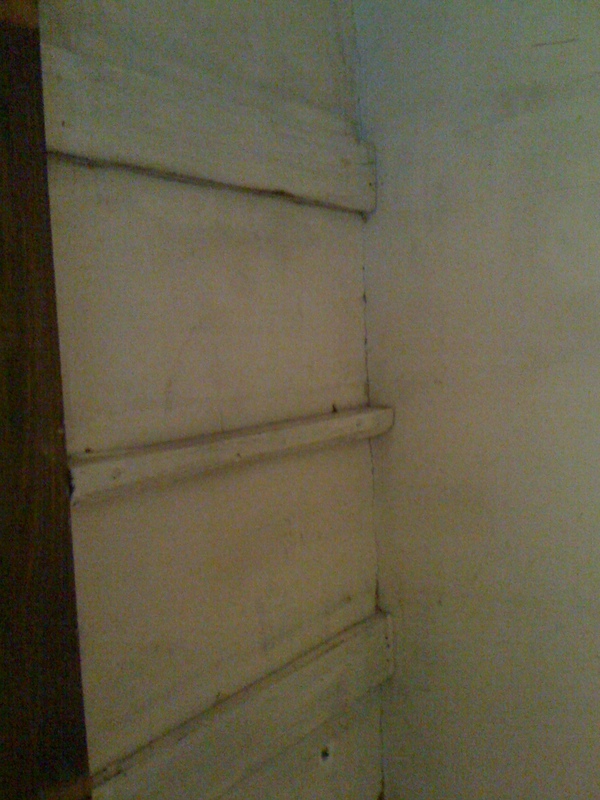 I went back and painted the walls a 2nd coat and here is what it looked like once it was dry. The shelves received several coats of paint, but in the end, they looked much, much better! It needed a lot of time to dry so that it wouldn’t be “tacky” to touch. 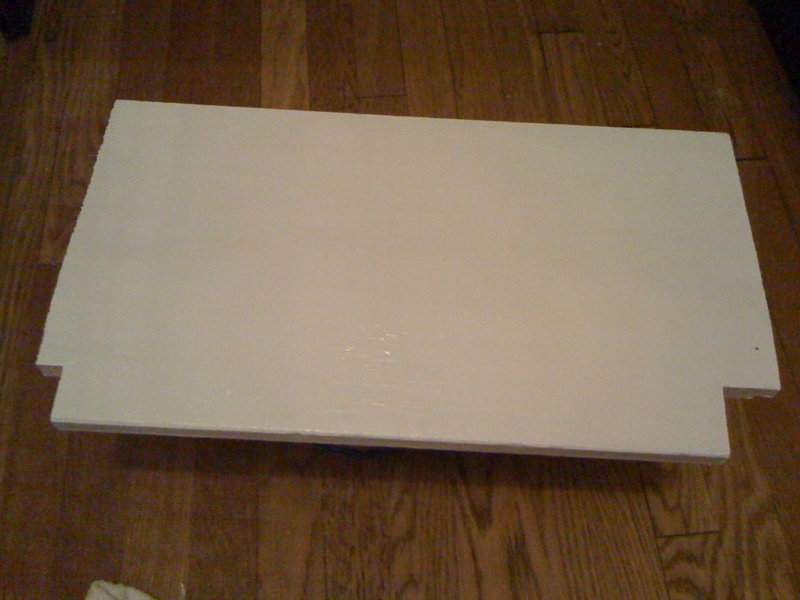 Otherwise, if I placed them on the wood notches in the closet, they would stick and the paint would peel. This is the end result as it is now. I moved the cleaning supplies to the laundry room/utility area and used the large basket for storage of toilet paper. 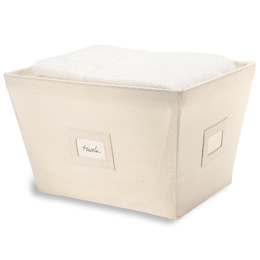 I found two fabric bins at Home Goods for $5.99 each and used them to store our stock of shampoos, soap, etc. 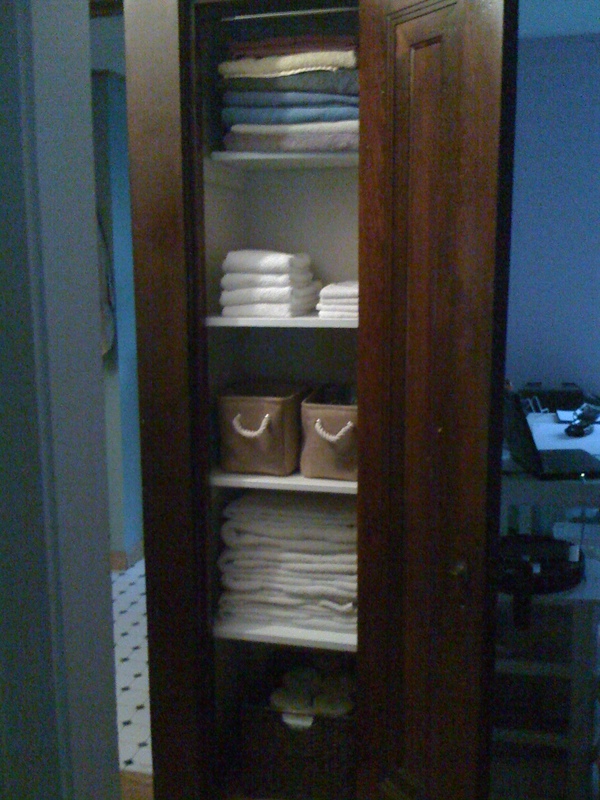 The mismatching towels will stay on the top shelf- I put a cheap adjustable curtain rod above this section and will cover it with a DIY curtain. If I were to start from scratch, and purchase all of these materials for this project, the costs would be as listed below. 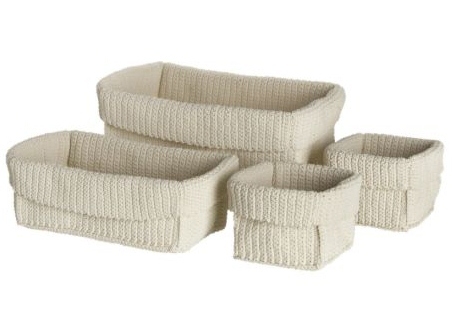 However, because I had most of these supplies already, it actually cost me the price of the storage bins ($12.91).